Sergei Loznitsa. Photo from personal archive.Inspired by propaganda videos about life in the unrecognised republics in Ukraine’s Donbas, Sergei Loznitsa’s feature film Donbass is Ukraine’s nomination to the 2019 US Academy Awards. Many Ukrainian critics saw Loznitsa’s film as a vivid illustrative tale of hatred and propaganda, a film that shows the surrealism of war and the surrealist reality it provokes. 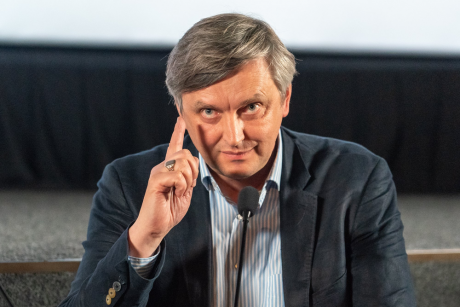 The Ukrainian release of Donbass virtually coincided with that of Loznitsa’s new documentary Victory Day and a series of master classes which the director gave under the general title of “Theatre of War”, curated by the Oleksandr Dovzhenko National Film Centre as part of their “Culture Film” project. I’d like to start our conversation with your 1998 documentary work Life. Autumn. In my view, what you have done in cinema since then is portraiture – portraying not so much separate individuals, but time and generations. In this sense, I would compare your documentary work with the project of German photographer August Sander “People of the Twentieth Century”, who, throughout his life, made portraits of people. And if I’m not mistaken, then the question arises as to why you felt an affinity to this genre previously and why you have since abandoned it. No matter how and what you shoot, there will always be people in the frame. You will end up shooting portraits of people. I prefer not to ask people about what they think, I prefer not to talk with them, but simply film them. I have always tried to make films without dialogues, films which, using the language of cinema, bore witness to the lives of these people. Speaking of Sander, I would have brought to mind another film of mine, Portrait. When I shot that film, I knew nothing about Sander’s photography. Sander’s idea was to capture a memory of all living people. He photographed the people he saw around him, and left behind a colossal photographic legacy. Sergei Loznitsa. Photo from personal archive.I was driven by completely different motives. In expeditions, in journeys around Russia in search of filming locations I encountered some amazing characters. I began to shoot them on film and soon became aware that when they began to pose in front of the camera, when they stood motionless and without saying a single word, they “dropped out” of the ordinary course of life. This was a condition of collapse and timelessness. I tried to capture this. Sometimes I succeeded but not always. It seemed interesting to make a film from these portraits. But, of course, this film has another theme – abandoned space. In it there’s a kind of a piercing note for me, a kind of muffled scream. A kind of unceasing sorrow that lasts for 30 minutes. In your most recent films you show the masses, society, a human collectivity. But you show this connection between people differently in each film. What, for you personally, is the difference in this collectivity between your films Maidan and Victory Day? Maidan and Victory Day are two completely different films, connected only by the theme of history. One film records history, taking place before our eyes. The second deals with a ritual. A ritual of remembrance emerges after the historical moment has ended. Victory Day is about a place where nothing happened, and the memorial was created afterwards. Nothing special actually happened in Treptower Park. The location was simply considered suitable for a memorial site. The remains of Soviet soldiers were brought there. They were exhumed elsewhere and then buried in Treptower Park, creating the Tomb of the “Unknown Soldier”. “Unknown Soldier” sounds rather strange because the troops that marched on Berlin were regular Soviet army forces. The names of these soldiers were known. Why, then, did they need to introduce this term, the “Unknown Soldier”? For the simple reason that anyone can imagine oneself becoming this anonymous “unknown soldier” and being in his place. This is rather theatrical – like the use of mask in Greek theatre. Ancient Greeks made actors cover their faces with masks, representing various human emotions, so that any member of the audience imagine themselves in the place of the actor. This very same method of identification was employed in creating the monument. I wanted to explore the ways in which this tradition of memorialisation is maintained, and how people try to recreate it anew. On the one hand, this whole ritual is akin to a carnival or a folk play. We see real mummers in the film: different people put on military uniforms, including Germans. On the other hand, some of the visitors are driven by genuine feelings: they bring flowers to the graves and mourn the dead. It is both tragic and absurd because all this is happening at one and the same time. In your films you often address the theme of memory, especially traumatic memory. That memory is particularly fresh and painful for people living in the post-Soviet space. Cinema can make the suffering greater, or, alternatively, it can work therapeutically. In your view, how can documentary cinema work with this subject matter, how careful should it be and how detached should the director be? Can a director be deliberately provocative or, let’s put it this way, can the film be a personal statement? Basically, I’d like to hear your thoughts about the limits of documentary, the need for detachment and the authorial position. Cinema, like any other art form, does not owe anything to anyone. Above all, it is a question of absolute freedom and creation. I make films about the subjects, which I’m passionate about. One could ask why I’m preoccupied with these issues. Of course, comic motifs and comic episodes do exist in my films, but, in general, my cinema is predominantly about constant suffering and tragedy. Perhaps, it’s the destiny of this place. Look in the eyes of the people. Look around, at the scars in the city. In Kyiv they are everywhere. I don’t know how one could film otherwise. Everything speaks of trauma here. One should do something about this because this is closing in upon us. You work with found footage. How does the selection of material take place? What motivates you to choose your material? How does the editing take place? If we’re speaking about Donbass, which is based on amateur videos, there were several selection criteria. The first criterion is that the episode chosen should describe the different sides of corruption, that strange phenomenon. Corruption not only in its narrow sense when someone bribes someone else, but also in a wider sense, the corruption of morals, the corruption of the individual, the corruption of society, its disintegration. I was looking for scenes and episodes, which could be presented as diverse manifestations of humiliation, degradation and disintegration. For example, I chose a scene at a basement where people take shelter during the war; a temporary boss (as we now see, they change these bosses like gloves); Cossacks; looters robbing others of their property, money, cars. I built up a palette describing the state of affairs in this place. What sits at the core of all these phenomena is plunder. Everything else only covers this plunder up, camouflages it with the idea of a struggle for peace in the world (be it the “Russian World” or some other), the struggle against non-existing fascists and so on. Edited films often generate a debate about the ethics of using these materials (archival clips, found video). How far can this material be manipulative? If we’re talking about feature films, it is all the product of imagination, of course. How can you discuss fantasy from an ethical point of view? You can give a moral judgment of my behaviour in life but the characters in Donbass are not subject to this judgment. They are only shadows on the screen. In documentary the situation is different. For example, if I film three bastards beating someone up, then I am behaving unethically, because I should be defending the victim, not filming it. This is an act of life, not of cinema. Here, then, we can no longer talk about cinema, the whole illusion of cinema falls apart. If I use such a scene in a documentary, the viewer could (justly) accuse me of cruelty – how could I stand by and observe someone getting beaten up! My unethical behaviour in life would have destroyed the illusion of cinema. But if I manage to obtain material not violating social conventions, it makes no sense to apply any further ethical criteria. I will do with the material whatever I want. It is cinema, not reality. Unfortunately, many still confuse these two things and believe that documentary cinema represents “reality”. This is not the case in actual fact. Even news items are manipulations. Because where the camera is, life ends, and cinema begins. You see only what people have allowed to show- after all, someone placed the camera in that location, set the frame, took the decision when to begin shooting and when to say “cut”. One should not justify idiotic expectations. Unfortunately, many directors of documentary cinema pander to these expectations, play these games. 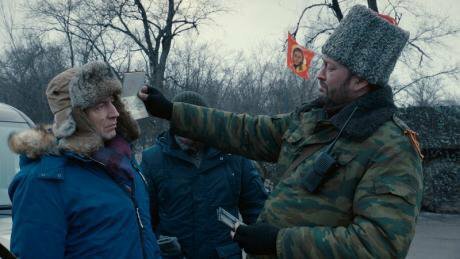 Did you watch other films about the Donbas filmed before you started preparing this film? This wasn’t necessary for me. I read people’s stories, the journals and interviews of those who found themselves in captivity, I watched YouTube videos. 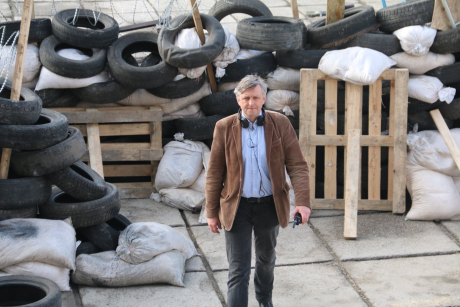 I studied the video material shot both by Ukrainians and by separatists. Would your film have happened without the support of Ukraine’s State Cinema Committee? I’m very grateful to Goskino. Without their funding it would have been difficult for us to shoot. If I want to film in Ukraine (and I wanted to shoot in Ukraine), it is necessary to have at least some money from here insofar as I cannot fully spend money here received from Germany, France, Romania, the Czech Republic, Latvia, Lithuania. There are certain obligations regarding the expenditure of state funds. The filming period cost about $800,000-900,000. The sum allotted by Goskino was about $500,000. We spent another $400,000 or so we received from European funds. This money was spent in Ukraine and from this point of view it turned out to be a big plus for Ukraine. Here lies the reason to co-produce. What do you think of the term “patriotic cinema”? Can one adopt this formula to the films of today? What should one now incorporate into this term? Can one consider your film in this vein? I’m rather wary of the term “patriotism”, as I see it there has been a vulgarisation of this notion. What do people have in mind when they call some film or other “patriotic”? I am a patriot of the planet Earth, of the city of Kyiv. I can make a film declaring my love for the city of Kyiv, but this will not be a “patriotic” film as state propaganda sees it. Probably Soviet times poisoned us with all such talk. The people who nowadays call their films “patriotic” continue working in that old Soviet tradition. One should not speculate on all this. There should be no attempt to direct cinema ideologically, it should simply be funded. Art as a whole should not be censored or ideologically guided, there are talented people who know perfectly well how they wish to proceed with their art. They should not be censored or restricted. Under the right conditions, new films and new directors will emerge. I don’t feel that there is any affinity between these films. Balabanov’s film is very strange, as was the author himself. I am really wary about what he did in his later years. His Cargo 200 is a bizarre film… It’s undoubtedly a hard-hitting film, but there are episodes in the film where I experience a sense of real discomfort. For example, the conversation “Where’s the truth, brother?” (a well-known phrase from Balabanov’s 2000 film Brother-2). These strange, “philosophical” conversations between gangsters, presented with such a degree of seriousness, that one feels rather awkward, as though the whole of world philosophy never existed. In one of your interviews you said you began to shoot your film Austerlitz out of a sense of discomfort. That is a different type of discomfort. Here it is about not knowing how to behave in the situation I found myself in. How should I, as a tourist, look at a crematorium? There arises a feeling of discomfort, of cognitive dissonance. Is it possible, for example, to tell of the horror of Soviet concentration camps? You read the works of Varlam Shalamov, of Alexander Solzhenitsyn, but do you understand anything? You think that you feel something? And what does the word “understand” mean at all here? Because if you really grasp this horror for once, you would never be able to return to the status quo. Still from the film “Donbass”. Source: Pyramide Films. All rights reserved.This is what it is about, how impenetrable is this impenetrable wall. Is it at all possible to transmit this kind of experience? Before me there sits a person who has gone through all this, looking at me with understanding eyes. This person knows and understands that which is inaccessible. And between us there is a wall. These are the ideas, which lay at the basis of Austerlitz. Is it right to say that you shoot films about the post-Soviet individual? But what does post-Soviet mean? How does it differ from the Soviet? I do not see any changes. The fundamental things have not changed. Just as we were not able to speak with each other before, just as we were not able to respect each other, things have remained the same. This is particularly noticeable when a person who grew up in the Soviet Union finds himself in Europe, when the context changes. Then, as one wise woman once said, you can take the girl out of the country, but you can’t take the country out of the girl. The problems of Ukraine are being resolved in the same way as they were in the USSR: let’s forbid, let’s fight, let’s expunge! Did you read the last law on language, adopted at its first reading? There they write that language defines nation. This is, in my view, archaic and, furthermore, this text confuses the idea of the nation with that of the people. A nation arises when a state emerges, and various peoples can exist within a state. In Switzerland, for example, there are four state languages. Why shouldn’t we take the same path? Why should we have a norm imposed dividing people rather than uniting them? What will happen to the 15 million citizens of Ukraine whose first language is Russian? I am a citizen of the country of Ukraine, but now I cannot consider myself a representative of this nation. There is also a large paragraph on cinema in this legislation. For example, if 19% of the action in the film takes place in the Ukrainian language and 81% in Russian this film is considered to be of a foreign origin. How can one measure a work of art in percentages! Again, one can see a completely mindless, prohibitionist, Soviet approach. A nation cannot be defined by language, this is wrong. What does “speaking in the language of the enemy” actually mean? It’s not the fault of the Russian language that it’s being spoken by the criminals. The making of a film is often a strident political statement. But if one is to speak of the active civic participation of those working in film, how strong is the voice of a filmmaker? Can they be heard? For example, take the case of Oleg Sentsov – the entire film community appealed to Vladimir Putin, but this voice is yet to be heard. You know Salvador Dali once staged a performance entitled “The Rhinoceros is stronger than Reason”, where he lowered a statue of a rhinoceros onto a bust of Voltaire. I think it’s a rather good metaphor of the influence filmmakers really have in the contemporary world. You wanted to know how much the opinion of well-known people, and not only filmmakers, can influence the fate of Oleg Sentsov? I believe you know the answer to your question – not at all! Something is wrong in this world. Those in authority simply thumb their nose at filmmakers who act in Sentsov’s support, demanding the release of an innocent man. No one fears that the filmmakers will turn their backs on the authorities that ignore them. We live in very alarming times. Even in the Soviet period there was a possibility of getting people out from behind the Iron Curtain. There were politicians like Gerald Ford who could call Brezhnev and ask him to set someone free. One should not only talk about filmmakers. Ukraine has a government, there is a Ministry of Foreign Affairs, there are different agencies, which should make this cause their absolute priority and lobby the politicians in power. Do you know what is going on now? I am not privy to what is going on and am not sure anything is happening at all. I have my point of view, I have already proposed solutions, but no one listens to them. If Ukraine’s demands aren’t considered at all, then one should find a country that does count. One could give Oleg Sentsov citizenship of another country. For example, the freeing of a US citizen from a Russian detention centre is completely different from freeing a Ukrainian citizen. Why not talk with the USA so that they’d give Sentsov honorary citizenship and then sit down at the table with Russia to discuss the release of a US citizen? Just as Russia gave him Russian citizenship. He did not ask for it, Russia imposed it on him. One needs to file a lawsuit with an international tribunal. A country does not have the right to change the citizenship of a person – this is an international precedent. The political prisoner Oleg Sentsov is testimony to the weakness of the Ukrainian state. A president cannot lay claim to a second term if he cannot free one a single citizen. He has made that pledge. Oleg is imprisoned in Russia because he has become a symbol. Everyone knows that. If Putin hands him over (and only he can decide this), then he would expect something very significant in return, he would want us to pay a very high price for Sentsov’s freedom. It is up to the politicians to negotiate this price.